Today i went to Solo with my mother and my girlfriend. I was acting as a driver . She (my mother) was looking for a dress which she will use in my cousin's marriage next week in Semarang. We searched for several places in Solo and when i got into Solo Square, i found something which is strange for me. So it started when i entered the building. As usual, the first place i was looking for was the parking space. I took the ticket from the machine and i went to the back of the building and decided to take the parking space on top of the building. The space was full, so the parking boy asked me to park somewhere near the exit area. I asked him if it was a parking area because people will use that road to get out of the parking area and he said it was OK. I thought it was a bad idea, because people's car may get scratched if another driver is not good enough to make a turn on that area. If the parking area is full, then i suggest there are some notifications and don't use simple (and dangerous) way to get people's car parking not in the correct place. CSSHttpRequest (CHR) is a method for cross-domain AJAX using CSS for transport. Today i attend another meeting with UKDW Net Club community members. The meeting was supposed to be scheduled at 10 AM, but because there were giving training for new students about web, the meeting was re-scheduled to 1 PM. The main focus about the meeting is about the preparation for the dual boot and Linux install fezt that will be held next week. So far, the preparation was already being started and some of them were already finished, but we need more coordination during this week to make the event as good as possible. Today i finally gave my presentation about my thesis. I had to attend kolokium at UKDW before i went to UGM, so i stayed there until 2 PM. At 2.10, i went to UGM and prepare myself before giving the presentation. I was kinda shocked a little bit because the lecturers who will be the judge were Mr. Retantyo Wardoyo, Mr. Edy Winarko, and Mr. Khabib Mustofa. Few minutes later, i go inside the "judgment" room and i saw my friends was already inside because there was another friend of mine who also gave presentation. His session was supposed to end at 3 PM, but because of the "hot" discussion, it ended at 3.20 PM. Before my session started, the lecturers asks for some time to pray first. So my session starts at 3.40 PM and i finished around 5 PM (only one and half hour). In general, i can defend my thesis, but i must do better job at my final presentation around December (depends on how fast i make my revision, mostly about DFD). I must add more analysis on my reports, mostly about the Same Origin Policy. Well, at least i have passed one step and i'm one step closer to get my master degree. Let's hope i can graduate next January. Finally i had my presentation call this morning. Mr. Sugent, the administrator for my master degree program called me this morning asking whether i can give my presentation tomorrow. I actually have some activities tomorrow at my office, but i can leave that to my other colleagues, so i had to take this chance. If i missed it again like early this month, i don't know when will i get this opportunity again. Blogger help has added new article about how to make your blog loads faster. It only contains general solutions, but i think it's a good article for everybody because not everybody knows about this. Most of the solutions depends on Google technology/infrastructure as they will give your faster loading time and better services because they are located in Google server farms which is inter-connected with high speed connection. The phenomenal Jack Bauer has returned in 24. The seventh season has appeared yesterday and it's called Redemption. You will see the old hourly ticking style on every occasion. This add my weekly TV series collection after i followed CSI, Knight Rider, Heroes, and Prison Break. UKDW LUG (Linux User Group) and UKDW NetClub community will held a Dual Boot Demo and Linux Install Fezt event at 6 December 2008. This event will take place on Agape building and it will start at 9 AM until 3 PM. VIA has stated that they will work cooperatively with open source developer (mostly OpenChrome) to release their open source driver for VGA card. This was officially stated at Taiwan few days ago. What does it mean? It means that in the future, more support will be given to the driver as the driver is scheduled to be included in the next 2.6.28 kernel. In the past, some people were complaining due to lack of support for VIA chipset. They can only depend of OpenChrome package which is part of XOrg, which can't fulfill their requirements. By collaborating with open source and include the driver on the main kernel tree, it can also boost their sales, because many people will eventually use it and they can find better support of it. Lately, i have become a little bit lazy. I usually prepare all my materials before the first class started, but recently, i didn't do that again. I prepared most of the materials the night before i give the materials to the students. Even though i always reviewed my materials one day before, i think it's safer to finish the materials long before the class begins and have a small review one night before the class starts. Today i attended another meeting, but this time, with the students who joined the Net Club community in UKDW. They have a plan to merge the Linux User Group (LUG) community under the Net Club. I was also appointed to became their advisor and i accepted. This morning, i attended a meeting at my office which discussed about the planning for next year's classes. We agreed on several things and we also distributed our job to each lecturers with hope that we already can start preparing for next year. For next semester, i will teach two new subjects and two old subjects with one of them will be a team teaching with other lecturer. Teaching new subjects are really fun, because it's new for me, but as the consequences, i will have to make the materials from scratch. GMail team has done it again. 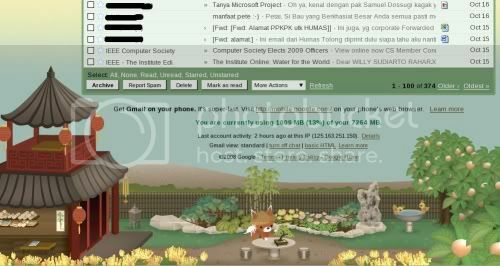 They have added new themes (30) to the current GMail themes which enables us to change themes as we logged in to GMail. In order to activate the new themes, click on the Lab icon next to your email accounts on the top right section and then click on the Themes tab. You will see lots of new themes which can be selected as your default theme. Update (08:53 AM): I have changed it into Tea House. It's very cute actually. Check the screenshot below. Update (16:07 PM):It seems that they use dynamic images, because just now, my themes has changed. Look at the second screenshot. With only one week since my post about my email usage which already reached 960 MB, right now i have surpassed 1000 MB of usage for GMail. I now used 1008 MB (13%) out of 7264 MB provided by GMail. In one week, i can collect up to 48 MB of email messages. I wonder what will it be by the end of this year? We are growing up every month and every year and it has been four years since the forum started in July 2004. OK, the JapFest 2008 has been started today and you still have until tomorrow to see lots of performance held in this two days. I went there this afternoon and there were so many people coming already, even though it's only in the early hours. At night, i didn't go there, but Anton said it was very crowded because of the singing contest, otaku contest, and many other games that were held at night. I have just upgraded Indonesian Linux Forum engine (phpBB3) to the latest version (3.0.3) which has just been released today. As always, i checked the changelog before i upgrade. phpBB offered several ways to upgrade the installation system. The preferred way is to use automatic updater which will look all your files, check the difference, and then merge them whenever possible. This feature is very handy and it has been improved since last update. The new mechanism works better with modified file (mostly if we install MODs), so the upgrade process is slightly easier than before. In the past, i have to check all the MODs after upgrading, but now, i don't have to anymore, as the MODs are still preserved and the updater merged the new changes into the old one, so no full replacement needed. Bravo and salute for the phpBB's developer. They have made their users easier by providing good upgrade mechanism. Lately, the sea monster in Ancol has become very popular among us. The video is already on YouTube and the news has been spread throughout mailing list. I don't know whether it's real or not, but by looking at the video, there's strong evidence that it was taken from Ancol. Perhaps future statement from Ancol management will be needed to clarify this news. I received several invitations this month, but unfortunately, i can't attend all those invitations, because it most of them are held outside Jogja. I can't sacrifice my classes just to attend all those events. The first is JAX Asia 2008. I have attended this event on 2006. At that time, i was still working in Jakarta, so i could came to this event. In 2007, i pass the event and probably i will do that again in 2008. The second event is Asia Africa Conference on Open Source which will be held in Jakarta at 18-19 November 2008. The conference will be hosted by RISTEK (Indonesian ministry of research and technology). The third one is IEEE ComSoc Indonesia 2008 which will be held in Bandung at 22 November 2008. The only event that i can attend was Sun Developer Day 2008 last week. I really wished that those kind of event would be held in Jogja someday in the future, so i can attend it more often. Well, that's the amount of my email usage currently (up to the time i post this) on my GMail account. There were 2189 email on trash which i hadn't deleted for some time. I believe it may reach 1 GB by the end of this year. Even though the quota growth are slowing down, it won't be a problem for me because my growth is slower than GMail's. Nowadays, i never used email client such as Outlook, Outlook Express, nor Thunderbird to download all my emails, because it would consume too much space on my system (except for my email which i got from my campus. I used pine and fetchmail to fetch those mail into my workstation). Also, i won't have problem when i had to go somewhere else and i don't bring my laptop because i can also access it via my mobile phone. OpenOffice.org has reached ten million downloads since it's release (OOo 3.0). This number was achieved after one month and also after the end of OpenOffice.org Annual Conference that was held in Beijing, China. This also marks the first OOo Con outside Europe. What a great achievement for OOo project which was ran by the communities and without advertisement budgets. This morning, i was planning to watch the latest movie of James Bond 007: Quantum of Solace. I watched the schedule this morning and the first schedule was on 10.30 AM. I went there around 10 AM and i was thinking that the queue won't be that long because in the past, 21 Cineplex opened at 10 AM and today is already the fourth day, so i am guessing that the audience will not be that much. I was WRONG!!! When i got there, the queue was already lining up until it reached the elevator outside the 21 Cineplex area. Amazing!!!. When i watched Spiderman 3, the queue list didn't surpass the 21 Cineplex area, even though it almost did. When i was on my way to Jakarta on Wednesday, i took a flight from Jogja to Jakarta. When i have sat in the chair, there were two peoples in front of me who used his mobile phone which was equipped with a digital camera to take a picture of one of the flight attendances. She was quite annoyed by the behavior of those passenger because it was done several time and she noticed it because there was a sound like when you had a digital camera taking a snapshots. Perhaps that's why the vendors didn't take away those sound when you are making a snapshots. It makes the object aware if they were being an object. But that's just the protection from the vendors. The best protection still lies on the person itself. It's called ethics. When people learned and know about ethics, they won't do such things even though they could. KDE 4.1.3 has been released and now it should be on the TODO list of Slackware-Current tree branch. We should expect it to be included in the future. The changelog lists all the detailed changes since 4.1.2. I have been invited to Sun Developer Day 2008, which i already stated on my previous blog. Today i went to Shangri La Hotel to attend the event. There i met with Alex, Kemas Antonius and several other friends who also attended the event. Actually i and Kemas already had an appointment to meet at JAX 2006, but we couldn't meet each other even though we both attend the event. Today, we meet and this is an unplanned situation. Probably something should not be planned first. This year, Sun has picked up a theme as a flight to the dream technology. The ballroom has been decorated like an airplane which will take us (the first class passengers) to the future technology which was presented by the evangelists who had come from outside Indonesia for this event. As you already know, i was awarded a Community Leader Award by Sun Microsystem for the Indonesian Native Lang for OpenOffice.org project. I received a plate with my name on it (Alex, photo please). There were other peoples who also received same rewards. I must say the event was very nice, except for the consumption. There were no orders and most of the people (i'm one of them) who didn't get a chance to enjoy the meal at coffee break. I'm sure the organizer should think of this in the future. Congratulations for the Sun Microsystem to hold this kind of event for four years in a row. Thanks also to the presenters, especially Chuk Munn Lee who have demonstrated a very nice presentation about RIA with JavaFX. I'm looking forward to attend next year event. For those who are working on IT related jobs, please consider looking at 2009 IT Salary Guide. While it's not the most precise number, it's based on a research done by Robert Half Technology. In general, there are still some increment, but not too high, mostly after the recession that happened in US and in most countries around the world. Here's the fact that has been concluded by them: "It is equally as challenging – or even more so – to find skilled IT applicants than it was a year ago." I will leave to Jakarta tomorrow and i will stay there until Saturday. Alex invited me to go to the Sun Developer Day 2008 which will be held in Shangri La hotel in Jakarta. Since the event will be held in the morning, i decided to go one day earlier because i'm not taking any risk. It's also a good chance to have some reunion with my colleagues in Jakarta. Io already had a daughter, so probably it will be a good idea to meet her too (she's still a few day old). Let's hope we can have a good reunion @ Jakarta. One year has passed since the first Japan Festival 2007 and this year, it's getting bigger with all the old and new events on the spot. 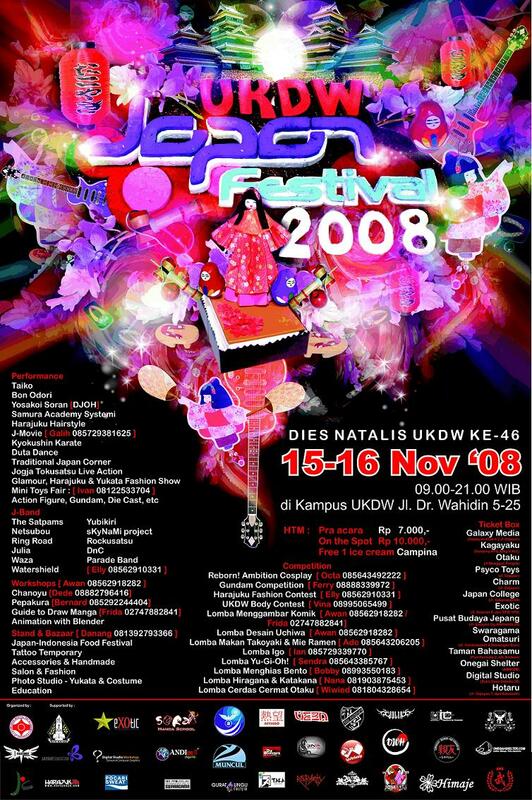 Yes, it's UKDW's Japan Festival 2008 which will be held at 15-16 November 2008 at UKDW. The show will be held 12 hours non stop from 9 AM until 9 PM. The ticket price is IDR 7000 (early bid) and IDR 10.000 (during the show). Most event that day must be related to Japanese culture, so it's a very unique event. Go check it out. This event was student's idea and they did most of the preparation by themselves. I hope this year will be better than last year which i couldn't attend, but i hope i can this year. I'm so curious about KDE 4.1 which has been released for some time. At the moment, Slackware-Current does provide KDE 4.1.2 on /testing, but the current build requires me to remove the KDE 3.5.x. This is not a good solution for me as i still think KDE 3.5.x is more stable and flexible compared to KDE 4.1.x. Also some application is still not ready in KDE 4, so i'm sticking to KDE 3.5.x probably until KDE 4.2 released next year (they are planning to release it at January). So when Kubuntu 8.10 has been released with KDE 4.1.2 on it, i tried it on a test computer which previously had Ubuntu 8.04 on it. I delete the old partition and install Kubuntu 8.10 on it. At first, i was impressed, since it seems that Kubuntu has done great job to make a good first impression. I had a chance to try the desktop effect as well and it's working, even though not all of them are available due to the usage of non high VGA cards. In general, everything works just great. Too bad 8.10 still ships with OOo 2.4.1, while OOo 3.0 is already being released. KDE 4.x should give performance boost during startup, but i experienced a slow startup even though the specs are quite good and i expected better performance with that spec. Well, it's not a major problem as i can live with it. I have just came back from Yogyakomtek, an annual computer exhibition held in JEC. Even though the dollar rate is so high nowadays, people still came to this events. Some of them did buy things, while the others were just looking around and prefer to wait until the rate is going down. It was rainy, so i guess not many people would come to this event, but i was wrong. People who used motorcycle still come to this event with some risk that they will get wet . It wasn't too bad when i got there, but when i wanted to go home, it was very bad rain, but i still had to leave and had dinner.